This Spicy Peanut Brittle recipe improves upon a classic candy by adding a modern element--smoky, spicy chipotle chili powder. The resulting candy is crunchy, nutty, sweet, spicy, and terribly addicting. If you cannot find chipotle chili powder, you can substitute another chili powder (preferably a smoked variety) instead. 1. Prepare a baking sheet by lining it with aluminum foil and spraying the foil with nonstick cooking spray; set aside for now. Combine the chile powder and the baking soda in a small bowl and set aside. 2. Combine the sugar, butter, and corn syrup in a medium saucepan over medium-high heat. Stir until the sugar and butter dissolve, then ​insert a candy thermometer. Continue to cook the candy, stirring frequently, until the candy thermometer reaches 275 degrees. 3. Once at 275, add the peanuts to the saucepan and stir to coat them with the candy. The candy might thicken and become difficult to stir, but continue to stir and cook the candy until the thermometer reaches 295 degrees. 4. Once at 295, remove the candy from the heat and add the chile powder and the baking soda. The baking soda will cause the candy to foam up, so stir carefully. Once they are incorporated, scrape the brittle onto the prepared baking sheet and spread it into a thin layer with a greased spatula. If desired, you can place another greased sheet of foil or parchment on top and roll the candy into a thin layer using a rolling pin. 5. Allow the brittle to cool completely, then break it into small pieces by hand. 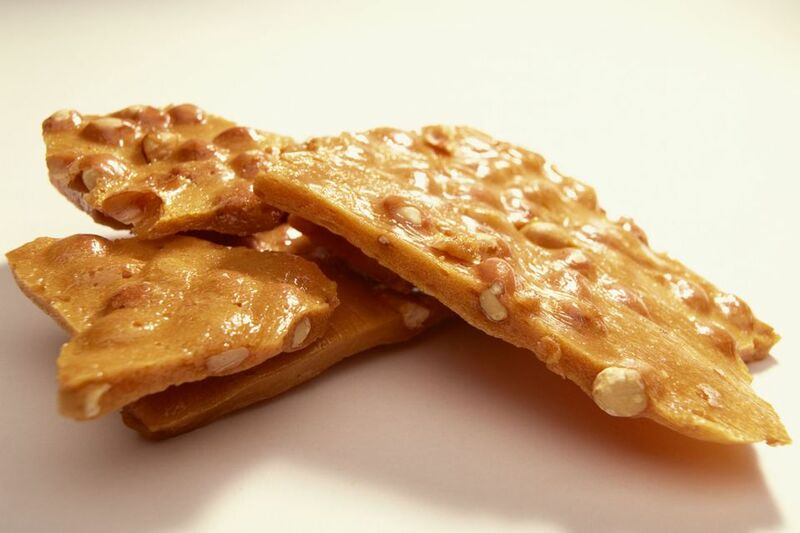 Store Spicy Peanut Brittle in an airtight container at room temperature for up to a week. Click Here for More Peanut Recipes! Check Out More Toffee Candy Recipes!